The kids are in pajamas all day. Mom is too busy sewing to change your clothes. And Elle playing toys where I am trying to sew. My craft closet spit out all my craft supplies. Mostly from me rummaging through everything to get out fabric. And my husband puts up with all the craft craziness. I am by no means a seamstress or a fashion designer. I would love to learn more about fashion design. But I really have no clue as to what I am doing. I usually see something that I am inspired by then I start sketching in my notebook. You would laugh at my sketches. It looks like the work of my 3-year-old. I have only been sewing for a little over a year. That’s right. It started with wanting to make simple rectangular valances for our dining room and kitchen. I had to go over to my grandma’s house for her to show me how. And that was November 2008. I have never taken a class. Never attended a sewing class. It’s been self taught through trial and error or asking my grandma and my sewing friend, Emily, for advice. It’s good to have people who knows about sewing than me because I just want to pick their brains and learn everything I can from them. There are MANY trial and error moments. Believe me. The seam ripper and I are best friends. And I have projects that can totally appear on Craft Fail. I don’t actually own a sewing machine. Nope. I’ve been borrowing my mom’s. It has been nice borrowing hers because when I do get around to purchasing my own (probably when she forces me to because she wants hers back) I know which features I would like in my machine. I don’t know how to read actual patterns. You know those cute patterns that come in the paper packets that they sell in stores? Yeah, those things. I’ve never made anything from them yet. I have quite a few of them in my house. I just haven’t gotten around to learning how to use them quite yet. Hopefully soon. I don’t have a craft room. I wish I had one. Totally jealous of all of you who have a craft room to leave all your craft stuff out everywhere. Or where you can close the door and no one bugs you while you’re working. Until then our couch will look like this while I’m in the mist of my sewing projects. So really. If I can sew, you can too. And let’s learn together! »Tell me… Do you sew? Why or why not? When did you start sewing? I desperately want to sew. I have fabric, a sewing machine and ideas. I even set up a sewing table I got for Christmas in my son’s room with all the craft goodies on it. It’s now may and I haven’t sewn a thing. I feel like I can’t because there are too many other things that need to get done in my home so no time for sewing. It is so frustrating. Loved all the skirts. I attempt to sew but I’m still at pillow covers and curtains. 🙂 I need to be brave and just get to it. I LOVE sewing! I started off just like you did, but sewing pillows for my sofa lol. I’m now totally hooked. Check out http://www.patternreview.com Its a GREAT site and the people are really helpful and friendly. Oh Megan, I’m so there with you! 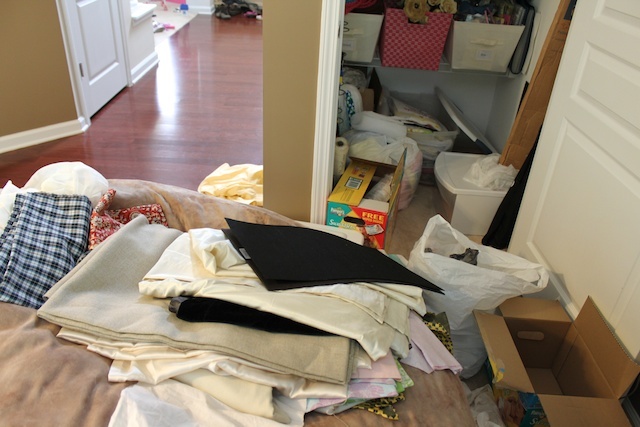 I have so many awesome ideas, not only about sewing, but when it comes down to it, dishes, laundry and cooking take precedence… But I really think it comes down to time management on my part… I’m paralyzed by disorganization and procrastination! Megan, I just loved your post today! I’m a beginner and I get so frustrated. I do not like the seam ripper…although I must use him EVERY time I sew! I have found patterns off the net that have pdf files and pictures to go by. MUCH easier for me than the tissue paper directions in a conventional pattern pack. Pictures I can do! I’m enjoying following your blog. LOVE your blog design. I applaude any mother of young children who attempts to sew. Children are completely intriqued by your actions and crawl on, around and over it the whole time…I started to sew when I was ten years old because my older sisters were learning and I did not want to be left out. I started by making little doll clothes for my stuffed red monkey. No patterns–just guess and cut. A year later I took to “real” sewing—with patterns making clothes for myself. Leaning to sew with patterns is not very hard–the step by step instuctions bring your through it-if you have a person to answer questions your first time you will be very successful. After sewing simple pillows, curtains –straight line things,I would go for something with it all–sleeves, zipper, gathering, collar–but not buttonholes- Use very cheap fabric in case it doesnt work out. But you will learn all the parts of sewing…! It is not often economical to sew clothes from new fabric, but you will be able to reservice more easily when you understand patterns. I love this! I seriously have a thousand pictures of the crazy things my kids are doing while I sew with a post planned showing the behind the scenes! Crazy stuff. And yes I am with you, my seam ripper is named because we are such good friends! You are sew sweet (lol) for sharing this! Thanks for making it seem more accessible 😉 You make beautiful things!!! Awesome! That definitely looks like sewing days around my house too! Except my house is tiny so ANY clutter feels like absolute chaos! And for those of you who are beginning sewers, let me tell you that even with years of sewing experience, the seam ripper will still be your best friend! I’m a pretty accomplished seamstress at this point and I count myself lucky to complete a project without having to rip anything at all out. Embracing it just makes the process more pleasurable! Yea! I just started sewing in Novemember after purchasing my first machine. I LOVE it but wish I had more time to sit and sew. Recently, my daughter had an accident that required over 10 stitches in her forehead. Because she has to be out of the sun now for the next six months (so it’ll minimize scaring) I found a lovely pattern for a hat made from an old T-shirt. It turned out great! No formal training but I can following directions. I’ve recently started using patterns, they’re not as hard as they look! I started sewing in high school but didn’t pick it up again until my wedding (15 years later!). Then I took another long break (5 years) and I just bought a new sewing machine (which I broke already…no idea what I did!). My “craft corner” is in the corner of the girls’ playroom so my girls are playing at my feet too as I sew. Now that they are 3 (twins), they are easier to manage while I sew. Since it’s been a while, I’m relearning everything again, so another fan of the seam ripper here! Have fun sewing! Love your blog…I didn’t find it in time for skirt week but I’ll be coming back for ideas! I started sewing about six years ago. I signed up for one of those block of the month classes at the local quilt store – our are so nice, you pay $5 for the first class, then if you have your block done by the next class, you get the next block materials for free – anyway, the blocks were HARD! And, got progressively HARDER! Trial by fire, right? But I got done at the end with 12 blocks to make a quilt, and a quilting habit that’s still going strong. Good for you for sewing, even with little ones around. It’s hard, but it’s a good “me time” activity, too! i don’t dare venturing into quilting. that is one area of sewing that i am completely intimidated by. and the people who quilt are amazing. I cannot thank you enough for posting this–I was seriously getting soooo jealous of you! All for nothing–you’re just like me (kids in jammies all day long over here, too!). I love your site even more now! Thank you so very much for showing us “behind the scenes”! My mom has always been a sown and being left-handed it was harder for her (and all my right-handed friends) to show me because how they held the fabric and such was backwards to me. But I love all the projects that my sewing friends make, so I threw in the towel and bought a sewing machine about a year ago. It has taken many throw aways and attempts but I am starting to get the hang of it and have recently made pillow covers, zippered bags and some other miscellaneous items that not only I, but my friends and family, love. It is really a rewarding skill and I am loving all the ideas and notions I find online! Thanks. we can be so thoughtless of the lefties huh? my husband is a lefty and he makes that argument all the time. i think they do have lefty sewing scissors though. My mom bought me my first sewing machine when I was seven. The only thing I learned to make was sleeping bags for my Barbie dolls. I was hopeless. My mom made me take a sewing class at school in 7th grade and I hadn’t touched a machine again until May 2008 when my daughter was 6 months old. I didn’t remember a thing so I am relearning on my own through trial and error. The seam ripper and I have a love/hate relationship. I do use paper patterns from the store but they can be difficult to read and understand. I watch a LOT of YouTube “How-To” videos to figure out how to do some of what they tell you to do. oh wow. homemade christmas is quite the challenge. i’m sure you can do it though. Sewing is such a fun hobby. I have used a pattern once, but I mostly just wing it. I feel like I am exercising my mommy brain when I try to figure out how to sew something. that’s totally me, nikki. i like the challenge of figuring out how things piece together and ways to simplify it. it’s like a puzzle. I am a beginner at sewing, and love reading sewing tutorials. I just started sewing a few short months ago, and can only drool when I see all the things I could’ve been making, had I started earlier; better late than never, I guess. line! of course i remember savani. that’s so cool that she sews. and you can totally do it! i’ll have to come up with some boy stuff for your little boys though! that should get you psyched about sewing right? I just started sewing last week! I got a sewing machine Christmas 2006 and never used it…I wanted to but I just never had the time. After seeing so many things people had made with there machine I decided to just jump in. Im almost done with my first blanket…doesnt get much easier then straight lines! I dont have a craft room just a closet stuffed with all kinds of craft products. Looking forward to seeing more of your projects! hi amanda. i just figured out how to sew a straight line at the end of last year. sewing in a straight line is like backing up in a car for me. i over correct. and i finally figured out that if you just let it go, it’ll naturally go straight! hahaha! i’m glad we can learn sewing together. more posts coming this week about the basics of sewing! I had a term of sewing lessons in Home Economics in high school (made a pencil case and a T-shirt – in school colours), and then my Mum did some more sewing with me, but she’d only let me do straight-sewing, so I never really learnt that much. I bought my sewing machine when I needed to hem up a valance I’d bought for our bed. My first few attempts at clothes ended up in the Salvos bin – nothing wrong with them, they just didn’t fit me (aren’t homemade clothes meant to fit you better!). I’ve developed a bit more patience as I’ve got older, so clothes turn nicer. I’ve just discovered how easy kids’ clothes are to make. I too have a great relationship with my seam ripper – it’s important to make it feel wanted! I am ALL of the above as well, I am self taught and I started sewing by hand when I was about 13 years old. Like you my sketches look like the work of a three year old and I do not know how to read real patterns, but that doesn’t really worry me. I usually search for pictures on the internet of stuff that I would like to make, and then I put together one or two pieces from the stuff that I already own to create the one I see in the picture. Sewing and creating stuff by sewing it yourself is so much fun. Trial and error definitely teach you a lot and I am by no means an expert either but I always dreamed about being a fashion designer and designing my own clothes. Now I sort of do that and also repurpose a lot of clothing items, which for me is the most fun part about sewing! Love your blog by the way, and the skirts that you make are absolutely cute!! yes. trial and error is one of the best ways of learning. although there are many times where i’m thinking, “dang. i wished someone had told me!” but it doesn’t matter to me if i can’t read patterns yet. i will learn one day. but for now i’m like you… just figuring things out by seeing it. i love reading how everyone started sewing. i’m glad i’m not the only one who is just starting out! I found you on Today’s Creative Blog and immediately added you to my favs so I can easily come back again and again! 🙂 Those skirts are so cute!! I love that you are self taught. Me too, pretty much. My mom does beautiful sewing and I have memories of her sewing all kinds of things for us when we were kids. Halloween was always a big deal in her sewing room! (Actually it was her walk in closet in her bedroom!) I never learned to sew a stitch though and was beyond frustrated for years when I tried as an adult to sew. Finally something clicked when I admired a friend’s daughter’s dress and my friend told me that she had made it. I thought, RIGHT! THAT’S IT! I can DO this! (I was shouting at myself…not you or your readers…lol!) So I made my daughter a dress. It’s that simple. I don’t know what clicked, but I did ask my mom to help me and she showed my how to read a pattern…not hard at all, by the way! And that was the beginning of the end! Or the beginning of the beginning, depending on how you look at it…haha! That was over 20 years ago. Now I love to sew because I can make what I want in the color I want when I want. Sounds selfish that way, but I’d rather spend my money on something I really love than on styles that aren’t really “me,” ya know? And that kids in pj’s all day thing? Been there!!! Oh I absolutely love to sew! It is like my drug of choice. When I had my first child I couldn’t sew for the longest time because I never had free time and that was so depressing. Once my son started sleeping through the night and I had “me” time I started again and it was so reviving!